Goodreads says, "Beauty knows the Beast’s forest in her bones—and in her blood. Though she grew up with the city’s highest aristocrats, far from her father’s old lodge, she knows that the forest holds secrets and that her father is the only hunter who’s ever come close to discovering them. So when her father loses his fortune and moves Yeva and her sisters back to the outskirts of town, Yeva is secretly relieved. Out in the wilderness, there’s no pressure to make idle chatter with vapid baronessas…or to submit to marrying a wealthy gentleman. But Yeva’s father’s misfortune may have cost him his mind, and when he goes missing in the woods, Yeva sets her sights on one prey: the creature he’d been obsessively tracking just before his disappearance. Deaf to her sisters’ protests, Yeva hunts this strange Beast back into his own territory—a cursed valley, a ruined castle, and a world of creatures that Yeva’s only heard about in fairy tales. A world that can bring her ruin or salvation. Who will survive: the Beauty, or the Beast? " Yeva, our Beauty in this retelling of Beauty and the Beast, lives with her sisters and father in a quiet village, but she longs to be hunting in the woods. Her father, a successful merchant as well as an experienced hunter, runs into some bad luck and loses their fortune. They retreat to the woods in a dilapidated home and hope to start over. Her father, along with Yeva, must rely on their hunting skills once again to protect and provide for their family. There are a few problems with this though. For starters, there's Solmir, a well-known bachelor who has shown his interest in Yeva, much to her older sister's dismay. He creates a bit of a problem for Yeva. Then there's the fact that her father has gone out hunting and hasn't returned. Yeva goes to find him all while remembering what her father said about some strange Beast in the woods. Is this who has her father? 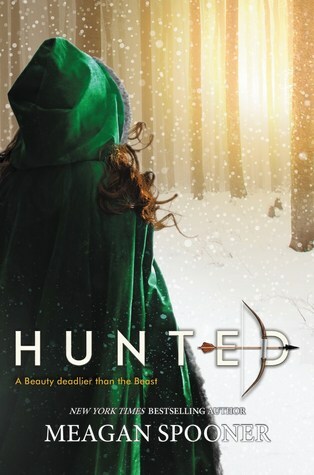 Meagan Spooner's Hunted is an entertaining retelling filled with Russian folklore. Fans of Beauty and the Beast as well as traditional fantasies won't be disappointed. I loved the character of Yeva in Hunted. She's complex. On one hand she is described as a Beauty and on the other hand, she is a ferocious hunter unlike her sisters who are content chatting away and doing mundane tasks at home. I love this kind of heroine, so Spooner has easily succeeded in making me care about Yeva. The character of the Beast is also an interesting one in Hunted. Readers get to know him a bit more as chapters alternate from his perspective and while they are just snippets, it's still effective to hear his viewpoint. While I didn't feel Beast and Yeva's slow-burn of a romance quite as much as I was hoping, I still enjoyed this unlikely pairing. One of the best part of Hunted is the Russian influence and folk-like tale quality as well as the setting. I think this was a nice touch by Spooner and it makes the story feel very fairy-tale-esque. Her world-building is also very well-done; I enjoyed being lost in Yeva's world. Despite the slow start, I really enjoyed Hunted. So, if you love all things Beauty and the Beast, definitely give this re-telling a try this winter. Haha. I know. I haven't liked most retellings other than Lunar Chronicles series and this one. Beauty and the Beast is all the rage. I am so excited for the movie, but I am not sure I will get there--may have to wait for it on DVD. Thanks for visiting, Joy! Hmmm. Beauty and the Beast retellings are tough for me because I'm not a big fan of this romantic trope but I love Meagan's writing so I am interested in this one. I do like the idea that we get some of the Beast's perspectives, that sounds cool. Great review! I hear you. I normally struggle with retellings, but I appreciated this one. The Beast's perspective was definitely a nice touch. Thanks for visiting, Cassi! I like that Yeva is a hunter in this one, and also that there are elements of Russian folklore. Sounds intriguing. Glad you enjoyed this one! It does have a nice cover too. I agree. The Russian folklore is definitely a nice touch and Yeva is a strong heroine for sure...my kind of heroine! Thanks for visiting, Greg! I love retellings but I'm most intrigued by the Russian folklore. Thanks for introducing me to this one.